It happens to every piece of furniture eventually. That time when it no longer looks comfortable in a newly re-decorated home. That was certainly the case for this piece of office furniture—a classic drop-down desk. Other desks often have unhappier outcomes as they are carted off somewhere unpleasant. This desk had a happier outcome. A well-applied shabby chic treatment saved the day. The desk was certainly well made by a reputable English manufacturer. Solid and hard-wearing, it was built to last. That’s always good to know when we start the shabby chic treatment. With step one we started with a complete sand of the desk with power sanders and hand sanding. It’s all those fiddly details and mouldings that have to be sanded by hand. With that done we gave the desk a coat of primer paint. Step two of its shabby chic treatment. And we followed this with a coat of undercoat. That’s how we start all our painting jobs. On occasions we also add a spot or two of anti-stain paint. That’s mainly needed for very dark tropical woods or those with young wood knots. With that done we got cracking with the top coats. At least two coats of paint are needed with all jobs. 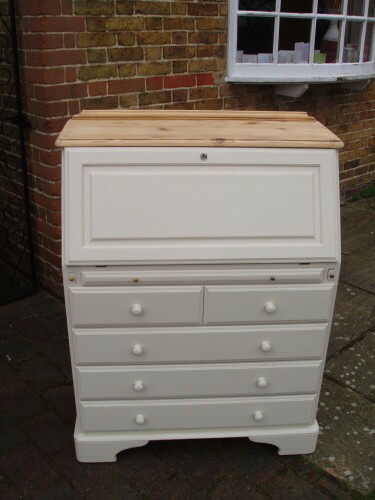 This shabby chic treatment involved three coats of paint (Joa’s White from Farrow and Ball). With the final coat of Joa’s White (Farrow and Ball) applied we could finish off the treatment with a gentle–very gentle–distressing of the paint finish. And with that completed we applied a coat of Briwax to finish off the shabby chic effect. We apply a polish to protect the paint, guarding against dust and thumb marks! It’s then easily cleanable and can be maintained very simply. On this occasion we used a clear wax. But equally, you could opt for a dark shabby chic wax to simulate ageing. 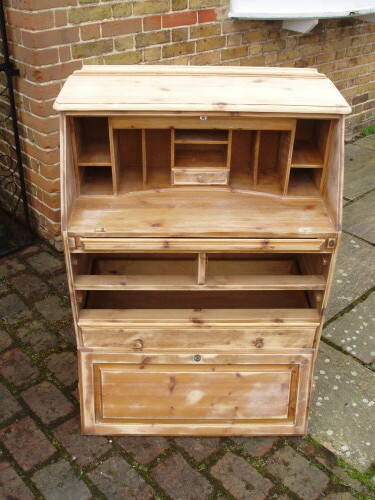 With this shabby chic desk we also left the top surface in its raw state with only a Briwax wax finish. It’s a popular look right now. 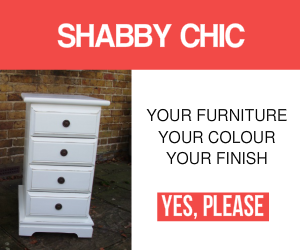 No doubt there will be more pieces of shabby chic furniture just like it. When you are ready to talk over the details of your next shabby chic project why not call us to discuss all the options?